William Hepworth Dixon (1821-79) was a trained lawyer and journalist who travelled extensively and wrote about it. This volume is one of two chronicling his travels in Russia, ‘from the Polar Sea to the Ural Mountains’. 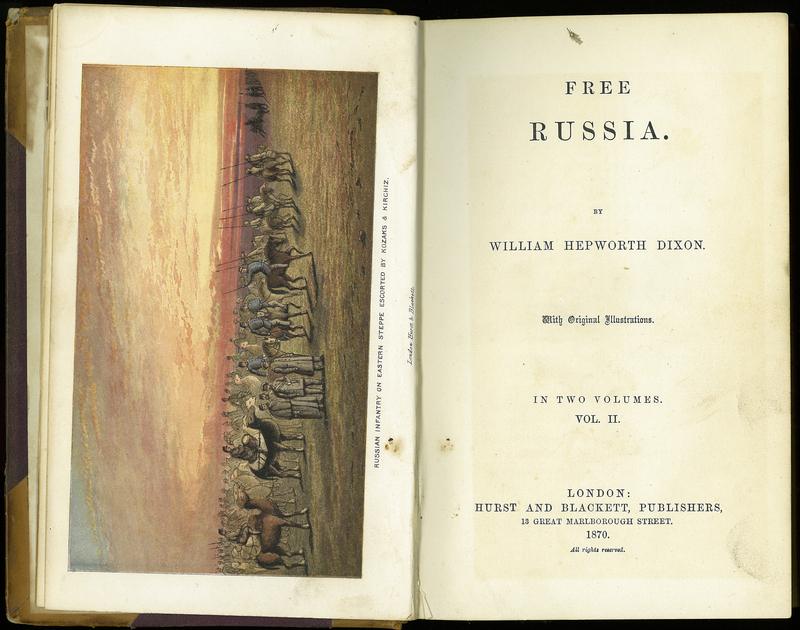 It is not clear who provided the artwork for this colourful frontispiece to Dixon’s Free Russia, but the landscape orientation lends itself well to the depiction of the far-reaching Russian steppe. Here Cossacks (Kozaks) and soldiers of Kyrgyzstan (Kirchiz) accompany the infantry. William Hepworth Dixon, “Free Russia. Vol. II,” ourheritage.ac.nz | OUR Heritage, accessed April 26, 2019, http://ourheritage.ac.nz/items/show/10703.